A car lies at the bottom of an icy ravine. Slumped over the steering wheel, dead, is the most critically acclaimed horror writer of his time. Was it an accident? His son Milo doesn't care. For the first time in his life, he's free. No more nightmarish readings, spooky animal rites, or moonlit visions of his father in the woods with a notebook and vampire make-up. Milo settles into a quiet routine--constructing model Greek warships and at last building a relationship with his sister Klara, who's home after a failed marriage and brief career as an English teacher. Then Klara hires a gardener to breathe new life into their overgrown estate. There's something odd about him--something eerily reminiscent of their father's most violent villain. Or is Milo imagining things? He's not sure. That all changes the day the gardener discovers something startling in the woods. Suddenly Milo is fighting for his life, forced to confront the power of fictional identity as he uncovers the shocking truth about his own dysfunctional family--and the supposed accident that claimed his parents' lives.
" B]rilliantly probes the authorship of horror in its many arenas: history, war, parenting, nature, love, the imagination." -- Michelle Latiolais, award-winning author of Widow and She. Michael Barsa grew up in a German-speaking household in New Jersey and spoke no English until he went to school. So began an epic struggle to master the American "R" and a lifelong fascination with language. He's lived on three continents and spent many summers in southern Germany and southern Vermont. He's worked as an award-winning grant writer, an English teacher, and an environmental lawyer. He's now teaches environmental and natural resources law. His scholarly articles have appeared in several major law reviews, and his writing on environmental policy has appeared in The Chicago Tribune and The Chicago Sun-Times. His short fiction has appeared in Sequoia. 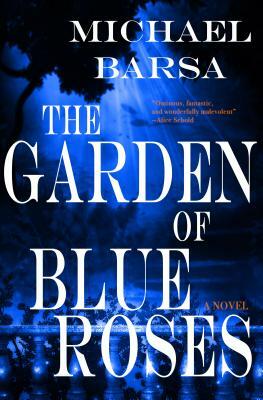 The Garden of Blue Roses is his first novel.